Whether we realize it or not, our daily lives are filled with multitudes of graphic and visual information. While reading a newspaper, watching television, walking on the street past countless advertisement, we constantly absorb information. 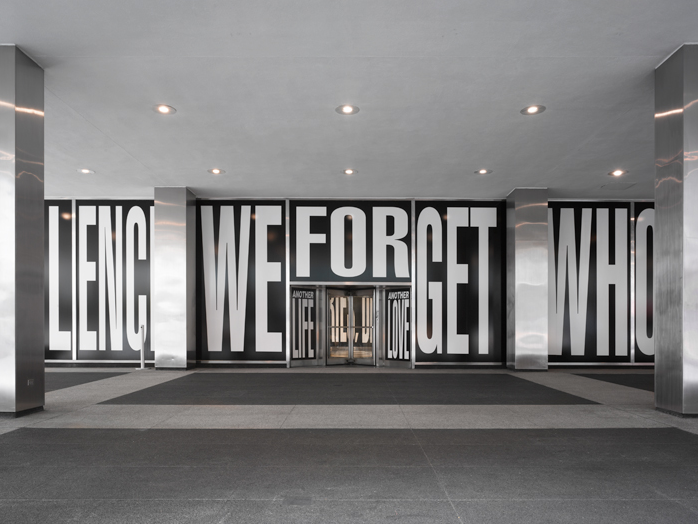 It is this aspect of social and public sphere that Barbara Kruger exploits in her current installation at the Lever House in New York. 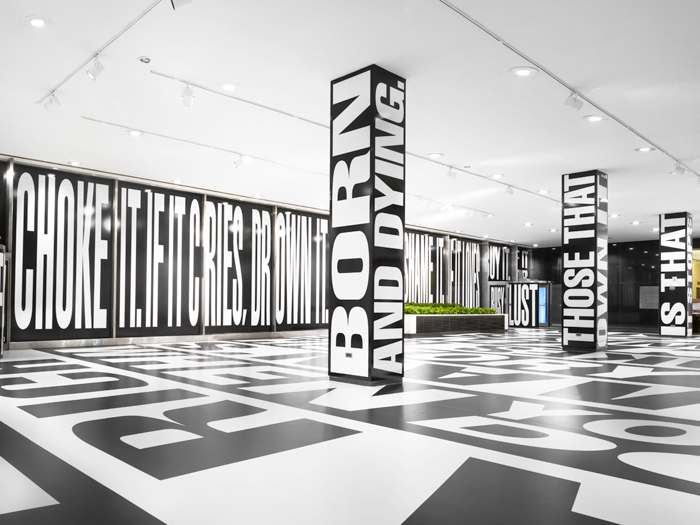 A project commissioned by the real estate mogul Aby Rosen, whose collection features such names as Jeff Koons, George Condo, John Chamberlain, Keith Harring, and Barnaby Furnas, holds tight to its message of “an image is worth a thousand words.” The text as art exhibition, titled “Between Being Born and Dying” runs through November 21st, 2009. 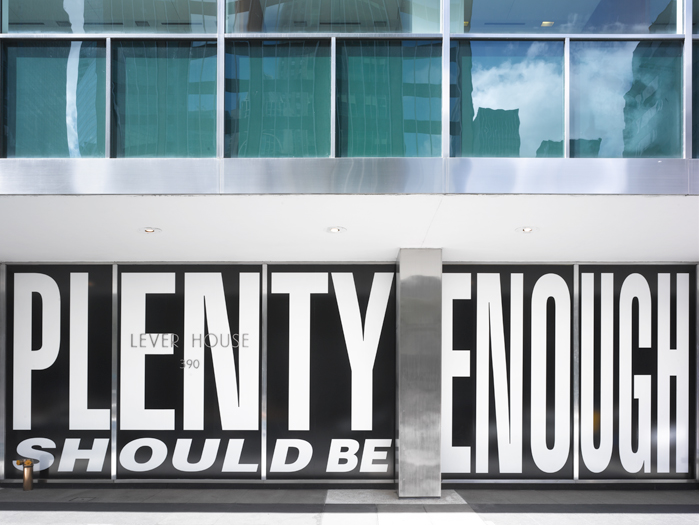 It is not coincidental that Barbara Kruger has adapted the verbal and textual content for her dynamic commentary of quotidian society. Having studied art and design with Diane Arbus at the Parsons School of Design in New York, Kruger developed a successful career in publishing working in graphic design and as an art director for Conde Nast publications, Aperture and others. 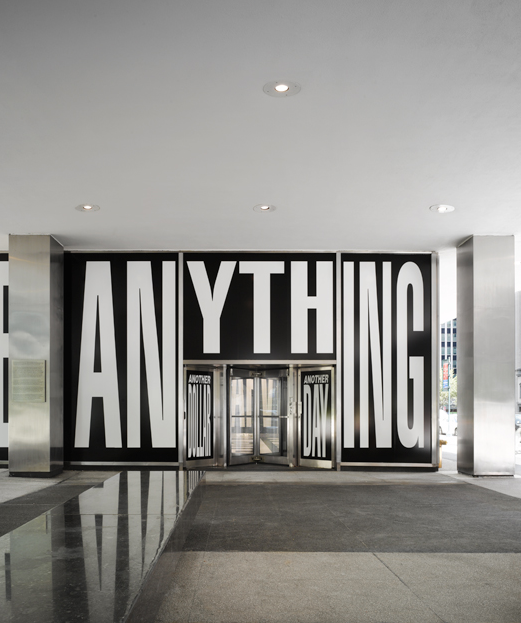 Her well established body of work generally explores the notions of consumerism and communication media. Kruger’s tools are her pithy and often poignant slogans, questions and phrases, which confront, inform, and humor the viewer with their nonchalance. 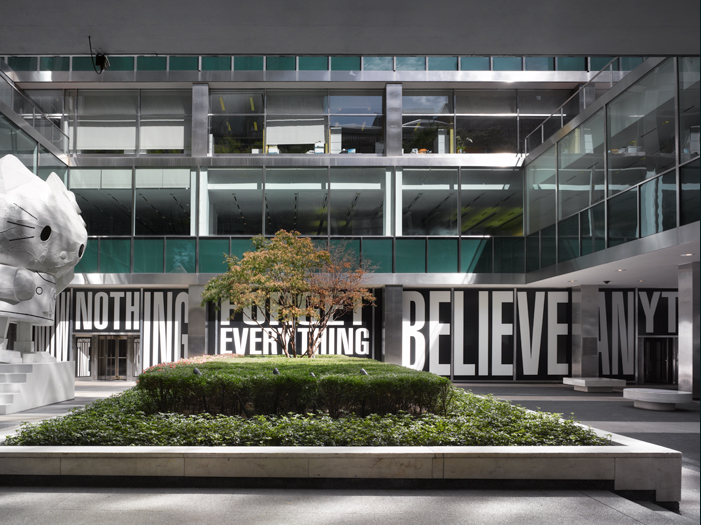 Similar to radio and advertising announcements Kruger’s words beckon one to “know nothing forget everything believe anything.” The stark contrast of black and white, the blunt manner in which these letters pop off clean and serene walls of the Lever House are distinct elements that force themselves to enter the viewers gaze. Political issues, feminisms, consumerism, individual autonomy, and desire, all enlist on the mission to engage the public on an intellectual level. 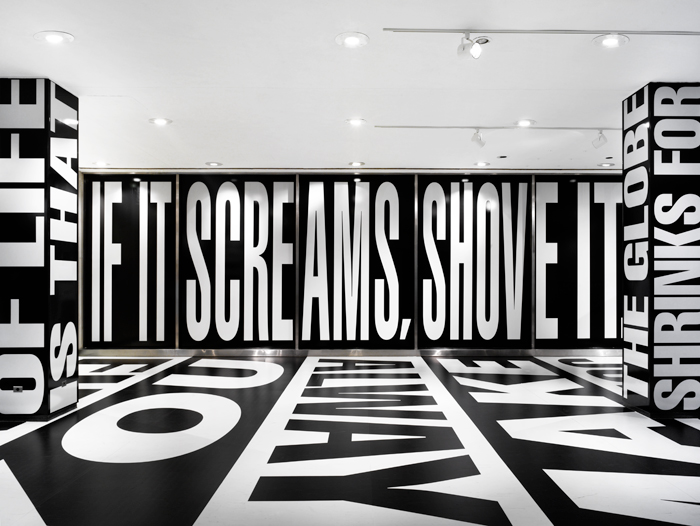 Barbara Kruger carries out her messages in a condensed, ultra-modern Helvetica font. 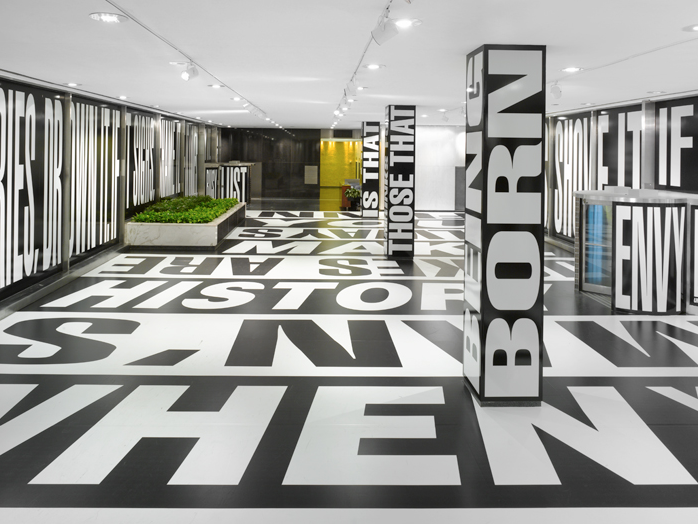 The typeface, designed by Max Meidinger and Edouard Hoffman some 52 years ago, was subject of the special exhibition “50 Years of Helvetica” held at the Museum of Modern Art April 2007 until March 2008. Its significance in everyday context is unmistakable and has appeared to soothe our lives via notes on our safety, travel, mailings, and other public communication. The smooth, clean lines create a neutral, universal and incredibly modern form, which Kruger uses to her advantage. Helvetica by the artist’s hand has gained a new dimension and proportion, one of an active participant in our social arena. Liverpool Echo (Liverpool, England) March 11, 2011 Byline: Catherine Jones Dragon Age 2 (BioWare, XBOX, PS3, PC) AS RPG’s go, very few could hold a candle to Dragon Age. The sheer depth and breadth of the game was immense, meaning developers BioWare were always going to have a tough job when it came to a follow up. With Dragon Age 2 they’ve aimed just as high, and managed to create a game which, while not as truly epic as its predecessor, is somehow more soulful. DA2’s graphics are more polished, the combat system has been revamped and the overall feel of the game has been finely tuned – yet somehow it just falls short of reaching its true potential. RATING: 7/10 – Other-worldly ? BARGAIN BUY: pounds 38.89 at www.amazon.co.uk Pokemon Black (GameFreak, DS) AS in the time honoured tradition of everything Pokemon, two versions of this game hit the stores last week – Black and White. There are a myriad of new Pokemon which players can catch, train and battle as the game progresses – and certain Pokemon are only available in each version of the game. The version I tried my hand at was the Black one. This was my first foray into the world of Pokemon – I was a tad long in the tooth when the whole phenomenon broke in the late 90s – so I can’t comment on how this version fairs up against others in the series. The action takes place in Black City, and you are summoned to see the Pokemon professor and choose your Pokemon. The fighting system was actually great fun, with a great feeling of oneupmanship when your Pokemon’s powers defeat anothers. This entry was posted on Sunday, November 1st, 2009 at 10:10 am	and is filed under Go See. You can follow any responses to this entry through the RSS 2.0 feed. You can leave a response, or trackback from your own site.